With the debut of new iPad Pro models today at WWDC, Apple has introduced a few new accessories for its tablets. Two of the new additions to the iPad Pro accessory line are called the Leather Sleeve for 10.5-inch iPad Pro and the Leather Sleeve for 12.9-inch iPad Pro, and they include a sleeve for the iPad Pro as well as a slot for users to store their Apple Pencil. The cases cost $129.00 for the 10.5-inch iPad Pro and $149.00 for the 12.9-inch iPad Pro. To match, Apple has also debuted a new $29.00 Apple Pencil Case, which acts as standalone storage for Apple's stylus accessory. Both the Leather Sleeve and Pencil Case come in Saddle Brown, Taupe, Midnight Blue, and Black. Users interested in the more traditional Smart Cover can buy a version of Apple's popular case for their new 10.5-inch iPad Pro at a price of $49.00, in seven colorways: Mist Blue, Pollen, Flamingo, White, Pink Sand, Midnight Blue, and Charcoal Gray. A Smart Keyboard for 10.5-inch iPad Pro is up for sale on Apple's website at $159.00. 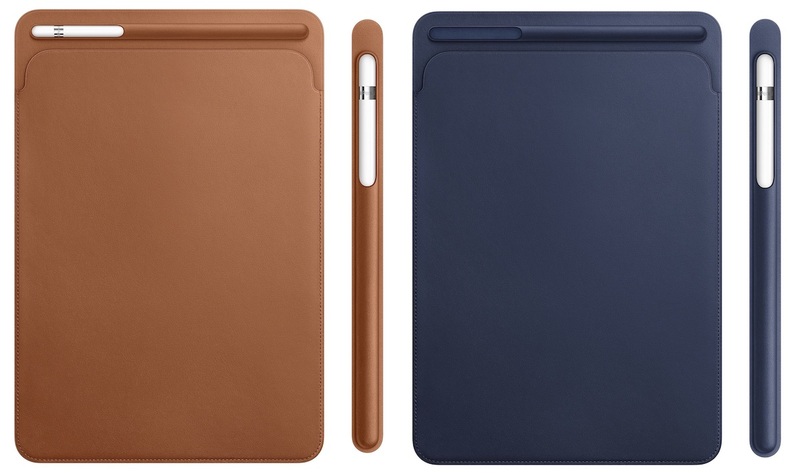 Both iPad Pro sizes have received new Leather Smart Cases as well, with the 10.5-inch iPad Pro version costing $69.00 and the 12.9-inch iPad Pro version costing $79.00. To stay up-to-date on all the latest WWDC news, or to catch up with anything you might have missed, be sure to check out the MacRumors WWDC 2017 event recap post here. How about smart case to cover the back when you get the keyboard.....how did Apple miss this? Don't see it. The article said "smart case" but the link was for the leather Smart Cover. The smart case for the Air 2 was hard to find at best of times and Apple realizes they can charge more than half the price for 1/2 the ($10) material, so I think the full Apple front and back case is done. Buy both halves if you so wish. $29 for a pencil sleeve is terrible, and with Amazon, as well as premium case sellers out there providing more options than ever, shipped the next day, Apple is probably snickering at the prices people are willing to pay for their own version of the product with the same material a assembled in neighbouring Chinese factories. I don't get it. I want the Smart Cover and silicone case. They offer the cover but no back? WTF? Are we sure the existing 9.7 stuff doesn't work? I'm curious if this will work with the Smart Cover on? I think that's a safe assumption. But it might be easier to wait until someone has hands-on with it. I bet you're right. It just seems so crazy to expect people to buy a sleeve and a Smart Keyboard. I guess Apple just expects people to carry the keyboard cover separately? If I wanted to do that I would just carry my old Apple bluetooth keyboard around. does the 9.7 fit in it? I'd like to know if the iPad with Smart Keyboard attached fits into the leather sleeve. Yea I'm pretty pissed about this. Really wanted a silicone case to go with my new 10.5". I'm not at all excited to go third party on the back. As much as I love Apple, they are so very inconsistent sometimes, like offering cases for all their iPad models except for their new one.